The 1605 classic adventure of an intrepid Spanish knight and his humble squire. Stars Bob Grant and Bernard Cribbins. The Adventures of the Ingenious Gentleman Don Quixote de Ie Mancha by Miguel De Cervantes Saavedra. 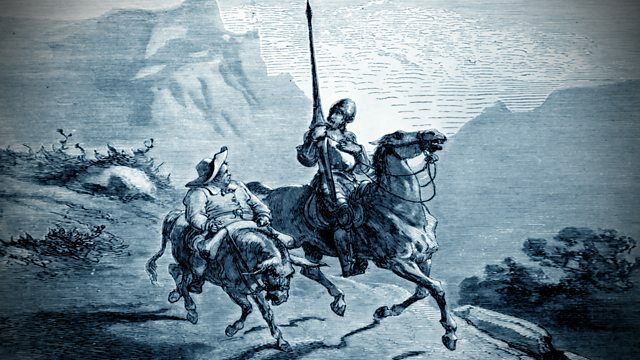 Don Quixote dons his rusty armour, mounts his broken down horse and sets off with Sancho Panza, his faithful squire, to put the world to rights. The classic adventure published in 1605. Adapted by John Arden. Starring Bob Grant as Don Quixote, Bernard Cribbins as Sancho Panza, Ronald Baddiley as Cervantes and Meg Johnson as Aldonza. Music composed by Stephen Boxer.